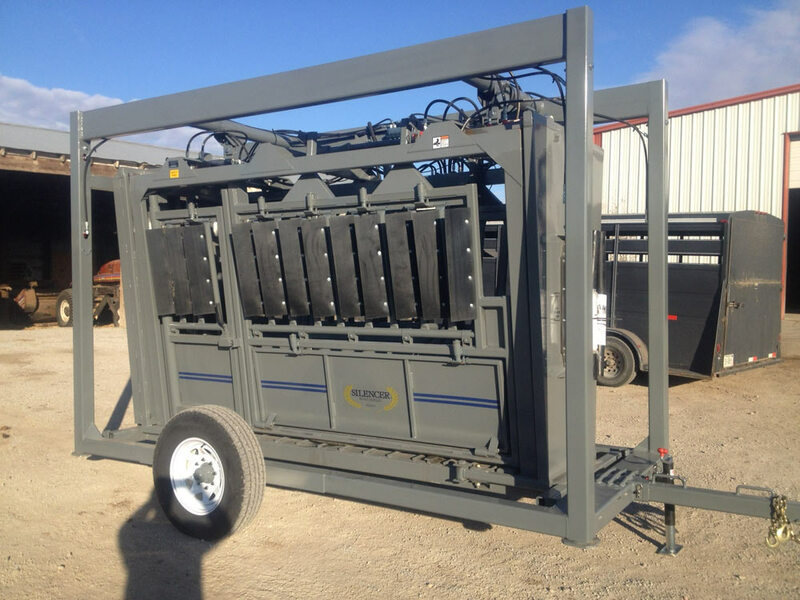 Transports for Ranch, Heavy Duty, and Commercial Pro Standard Length SILENCER Hydraulic Squeeze Chutes. The SILENCER Yoke Carrier is designed to transport your SILENCER hydraulic squeeze chute at highway speeds using a light duty pickup. Outstanding ground clearance of 11 inches even with platform scales intact. Highway hubs and torsion suspension provide a smooth ride, lessening shock stress to the carrier and the chute. The Yoke Carrier is easy to use to load and unload chutes, has a strong mainframe with a long hitch for 90 degree turns and a suspension system for longer life of equipment. A potable Honda gas power unit can be used to operate SILENCER chutes at any location. Lift front of yoke carrier hitch. Walk or back yoke carrier straddling chute. Hook 2 back pipe connector hooks onto chute. Connect winch hook to connector at front of squeeze chute. Winch/Lift chute until high enough to push square bar through both holes in the carrier and main frame on front of chute. Hook yoke carrier to vehicle. Disconnect yoke carrier from vehicle. The Carry-All Carrier is designed for transport of Standard Length Ranch and Heavy Duty Model SILENCER Hydraulic Squeeze Chutes, and is also useful for hauling panels and other various products. It is built with a strong mainframe, long hitch for 90 degree turns, along with a suspension system for longer life of the equipment. The SILENCER Carry-All uses hydraulics to lift the chute to carrying position and unloading position. 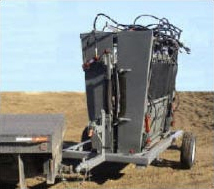 A portable Honda gas power unit can be bolted to the Carrier, eliminating the need to lift and move a power supply when transporting or operating the SILENCER. The gas power unit can also be used to operate the SILENCER chute at any location. The SILENCER Extended Chute is Portable! Simply back the Overhead Carrier and SILENCER Chute to the desired working area. Using the single, hydraulic cylinder, tilt the Carrier backwards and disconnect three chains. Then tilt Carrier toward front and disconnect three remaining chains. Pull vehicle and Overhead Carrier away, leaving SILENCER Chute where needed. The SILENCER Overhead Carrier is legal transport width and includes rubber torsion suspension and an extra long hitch for turning in tight areas. A portable Honda Gas Power unit can be bolted to the Carrier, eliminating the need to lift and move a power supply when transporting or operating the SILENCER. The gas power unit can also be used to operate the SILENCER chute at any location.